A queen is called upon many times, for many tasks, and to fill many roles. Whether it's as a hostess, a speaker, a presenter, a performer, or just someone in the background to add color and flair, Witti delivers. She can be counted on to show up on time (if not early! ), ready to go and eager to help give a special event a touch of style, a little glitter and a whole lot more mascara. Nothing is as beautiful as a diamond solitaire. Unless it's fifty or sixty diamonds together. The Imperial Court of New York turns the dial up to eleven when we go for high elegance, and in the words of the old song, "Nobody does it better." Witti has a classic style, best exemplified by the idea of Nolan Miller designing for Ethel Merman. How do you serve as Minister of Protocol and still make sure that you're on time for the Opening Number? Create a flawless, simple hostess gown that's actually convertible! Two snaps and the skirt falls away leaving a little black dress of which even the great Coco Chanel would be proud! Looking elegant and slender, Witti turns it out in this ball gown from Planet Pepper at the 2010 holiday party -- and don't you worry, teetotalers, she's raising a glass of club soda to your health!! At Night of a Thousand Gowns 2010 and 2011, Witti was honored to have been asked to introduce guests from the podium. In 2010, she presented the Out of Town Protocol with her good friend Bonbon LaRue, and here in 2011, she presents the fabulous collection of Nobless du Robe title holders. 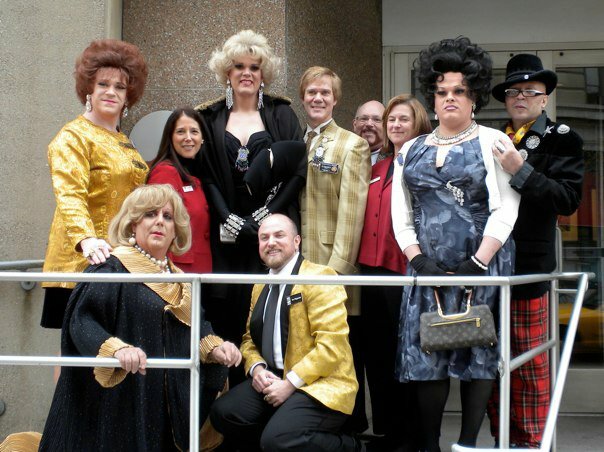 In 2002-2003, Witti had the deep pleasure of serving as Queen of the New York City Gay Men's Chorus. This photo is not only one of her favorites of she and partner Ian Flagrante (although years before he'd take that name! ), but is also the last Night of a Thousand Gowns she attended before coming home in 2009. Part of the role of Empress is dressing to the nines, dazzling with jewels and elegance and mocking the royal roles that are at the heart of our great game. One of the great things about our world is the fact that we ARE playing a game, and games are meant to be fun, creative, rejuvanating, and above all, ways to bring communities together. We love to have a good time, and love to give people a chance to smile, laugh, gasp at our creativity, and sometimes at our audacity! We are camp, we are delight and we are fun! Witti is a big fan of celebrations, particularly birthdays. At left, she celebrates the birthdays of Court Members born in April by performing Madonna's "Hanky Panky" - reaffirming the idea that at the end of the day, there's nothing like a good Spanky. Friend of the Court Anthony Bosco always throws an amazing birthday party for himself, to benefit ICNY. In 2010, his theme was "Lions and Tigers and Bosco -- Oh My!" Witti took the opportunity to go back to her leonine roots, to take some makeup tips from the cast of Cats and to purr for the entire night's extravaganza as the Cowardly Lioness. Anne Tique and Tony threw tradition to the wind and had Reign XXIII's investitures at the Italian-American Charities Hall in Queens. The theme? Come as your favorite Saint or Italian Stereotype. Here, Ian and Witti assay Mario and Luigi...winning hearts and nearly the costume contest! Here Comes the. . .
Witti's all time favorite Halloween costume, the Bride of Frankenstein. She played this role so successfully, she rated a photo on the back cover of a Comcast newsletter!! Feeling a responsibility to make an audience smile at something frivolous, fun, or playful is something that helps drive Witti's creativity and passion! P. S. I loved the costume so much, I brought it back in 2011! Part of the job of a monarch is reaching out to the greater community, representing ICNY and our mission, strengthening bridges and building new relationships. One does this by representing the court at events, serving as a special guest when called upon, stepping in to help where needed, and above all, entertaining crowds, inciting passions and bringing joy into peoples lives while helping to raise money and awareness! Witti blurred the lines of personal and professional when she co-hosted a fashion and talent show for Iris House, a Center for Women Living with HIV/AIDS. . . Michael works for them! 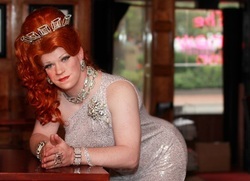 Called upon at the last minute to join three professional drag divas as a judge and panelist at NYU's 2011 Drag Race, Witti channeled her inner JoAnn Worley and entertained with her well placed comments. 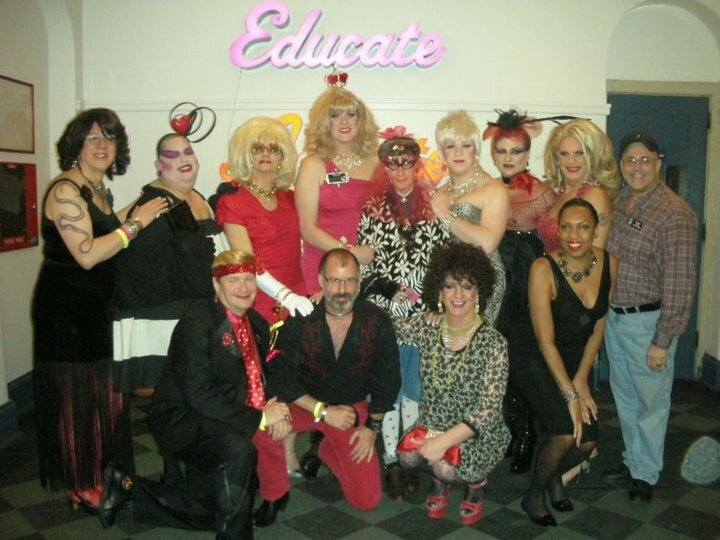 In early 2011, The Boys of Bearlesque called upon Witti to add a new element to their monthly benefit for the Ali Forney Center at Stonewall. She appeared in March, juggled two heroes back and forth and was invited to return for the farewell show in July. One of Witti's favorite performances involved creating a tribute to Empress Farrah Moans and her "Turkey Club". Working together with Pepper for a month, Witti recreated Michael Bennett's original choreography for "Turkey Lurkey Time" from the musical Promises Promises (well, insofar as two drag queens of a certain age and physical condition -- and the stage at Pieces could handle!) and danced up a storm! Though classically trained as a young performer, Witti favors classic Broadway and cabaret standards in her permanent repertoire. In her youth, she inadvisably did a show in which her set included "And I Am Telling You I'm Not Going" and the Streisand arrangement of "Pretty Women/The Ladies Who Lunch." Learning from that, she discovered young Rosemary Clooney and drew on that inspiration to build herself a more appropriate songbook, drawing on more likely performers Patti LuPone, Emily Skinner and Kay Thompson...and occasionally Bonnie Tyler. Never afraid to alter a lyric to personalize it for an audience, Witti has amused with rewrites of It's Today by Jerry Herman, Everything's Coming Up Roses by Styne and Sondheim, and most recently, an update of Adelaide's Lament, addressing the New York State Legislature's inability to pass Marriage Equality. Apparently, a number of members of that esteemed body were in the audience on April 29, 2011, because they passed the bill two short months later. Not always content just to sing a song for its own sake, Witti tries to imbue her performances with deep character work. She emotes, she caterwauls, she engages, she chews scenery, but never does she ever simply lipsync a ballad. On those occasions when a lipsync is most appropriate, audiences expect a camp twist, a raised eyebrow, and a tongue firmly planted in her cheek to help move the story and entertain the crowd. 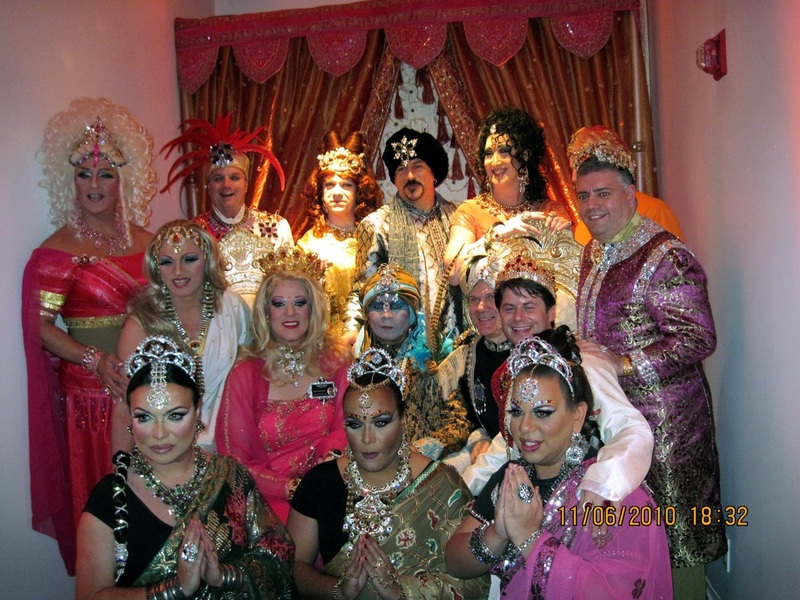 So much of what we do at The Imperial Court is as a group -- we entertain, we help with events, we bring a smile. Our service to the community is the price we pay for getting to play dress up in this fantastic game, and it's part of the fun. 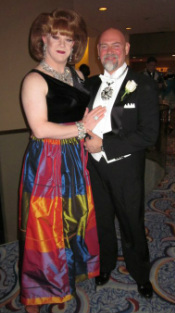 Members of the Imperial Court were asked to join the Red Ribbon Foundation at their bi-annual gala in Stamford, CT. We turned it up, turned it out and had a blast as subjects of the Raj! Some of the true joys of being a member of ICNY are the opportunities to go out and thank other volunteers, bring a smile to their face and help cheer them on. Thanksgiving Morning at God's Love We Deliver was such a beautiful experience, particularly from the point of view of someone who's been one of their regular volunteers that morning. Fortunately the Leather Fetish Fashion Show and the Center's Valentine's Day Dance were only seperated by a couple of floors! We got dolled up to attend one, then shifted our attentions downstairs to hosting the Dance! I love Hearts and Voices --as a performer, there is no audience more engaged than one that doesn't get out often. As someone who works for an AIDS Service Organization, I know how much it means to the clients when people come in from the outside to entertain, to enliven, and I love being able to do that as part of this great program.